If you’ve just made the decision to treat your hearing loss with hearing aids or you are in the market for a new style, you’ve come to the right place. Here are some tips on how to find the best hearing aid for you. Hearing devices are made of the same components, but they all have special features that make them unique. One of the most basic differences in hearing instruments is the style. There are several types, including in-the-ear, behind-the-ear, in-the-canal and receiver-in-canal. 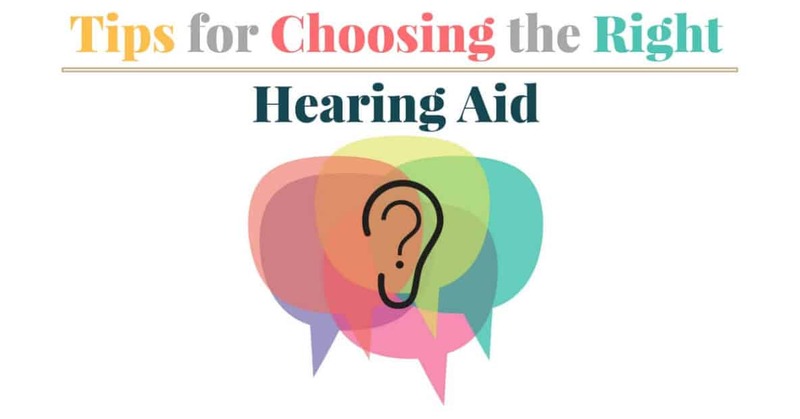 The audiologists at HeaRite can explain these styles in more detail to you and ensure that the style you may be interested in fits your needs, as some styles are better for specific degrees of hearing loss. An overview of these styles can be found on our website here. Cost can play a big factor in deciding which hearing device to choose. Prices can vary widely depending on style and features, but the price often reflects more than simply the mechanics. Manufacturers have to pay not only to produce the hearing instruments you wear, but also all of the technology behind them (source). Hearing devices are also incredibly durable, when you consider many people will wear their aids 12-18 hours per day through all kinds of weather conditions and activities. That being said, manufacturers and audiologists alike recognize that everyone will be working with a slightly different budget, and that’s why there is a huge range of options available to you. In general terms, behind-the-ear (BTE) styles tend to be less expensive, but are more visible. They are a good all-around option as they tend to have less feedback, are easy to adjust and have the fewest number of problems with wax or infections. On the other end, in-the-canal (ITC) styles are very unobtrusive but tend to be slightly pricier than BTE. Often, it comes down to your own preferences and what is most important to you personally. The best way to ensure that you are getting the most out of your hearing device is to contact our audiologists today for a hearing exam, where we can discuss your needs in a one-to-one, confidential setting. As mentioned above, certain styles are best depending on your degree of hearing loss. BTE hearing devices can be used by a range of hearing aid candidates, from those with mild to profound hearing loss. They are also easier to adjust and control, which means that they really are a great ‘all-around’ fit (https://www.nidcd.nih.gov/health/hearing-aids). In-the-ear (ITE) hearing instruments are used for mild to severe hearing loss, and can be fitted with telecoils that make it easier to have telephone conversations. These are a great option for people who wear glasses but for those who wish to have a more discreet option, the ITC style may be best. ITC hearing aids come in both completely-in-canal and invisible-in-canal styles. These aids are often better suited to those with mild to moderate hearing loss. Starkey Hearing Technologies, for instance, offers custom-made versions of the invisible-in-canal styles that are incredibly discreet! Receiver-in-canal hearing devices can treat a wide range of degrees of hearing loss and are also discreet, as the receiver is actually in the canal. An option such as Oticon’s Alta2 range, which uses advanced BrainHearing™ technology, provides premium performance in an assortment of styles, so you know that no matter what style you choose, you are getting a fantastic product. If you have an active lifestyle, you may want to factor this into your decision on the best hearing aids for you. Phonak’s Lyric™ hearing device, for example, is 100% invisible and is designed to be worn 24/7 for several months at a time. As it has built-in moisture protection, you can confidently play tennis or go for a run without worrying about your hearing aids. For those looking for something a bit simpler, but who enjoy an active lifestyle, choosing an option such as a BTE hearing device means that you can simply remove your hearing device before setting off to the court or mowing the lawn. Alternatively, accessories such as protective covers allow you to continue wearing your hearing instruments but with the knowledge that your hard work and perspiration isn’t going to get in the way of your hearing abilities. In today’s world, modern technology means that we can be connected to people all over the world with ease and efficiency. Hearing instruments have developed together with new technologies to ensure that people experiencing hearing loss can benefit as well. If you are someone who is often found on your iPhone, whether due to business or simply from keeping in touch with your loved ones, you may wish to consider the hearing aid technologies that allow you to connect your hearing aids with your iPhone. Starkey Hearing Technologies’ Made for iPhone feature allows receiver-in-canal and BTE hearing devices to connect directly to your iPhone, iPad, iPod touch and Apple Watch through the TruLink app. You can stream conference calls or FaceTime with your family directly from your iPhone to your hearing aids. Oticon is also a leading provider for this feature. Oticon Opn allows you to use your hearing instrument as if they were both headphones and a remote, linking music and phone calls directly to your hearing devices and giving you the power to switch programs and control volume too. Phonak offers a similar service with their EasyCall technology. As this feature uses Bluetooth, you can connect your hearing aids to a range of devices, including some non-smartphones. At HeaRite, we pride ourselves on our client focus and great customer service. Our team is here to assist you in making the right choice when it comes to choosing your hearing aids. We understand that every person is different, and we will work together with you to ensure that your hearing devices meet your specific needs. Contact our team today at HeaRite for your hearing evaluation or fitting.